(Long Island, N.Y.) Mentalist/Magician David Levitan seems to be able to know exactly what you’re thinking but he doesn’t claim to be able to read minds. His shows amaze audiences and he has entertained thousand s of people at parties, corporate dinners and trade shows. Along the way he has performed magic and mind-reading for celebrities including Alec Baldwin, Donald Trump, Howard Stern and Phil Collins. 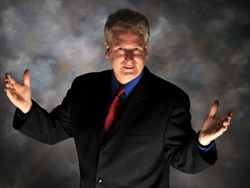 Recently he performed at the Manetto Hill Jewish Center in Plainview where he astounded his audience. In one demonstration he was able to determine a word someone chose randomly from four pages of the New York Times. 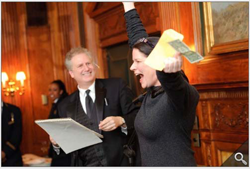 Before the show Levitan gave a random man who turned out to be Robert Foldes of North Bellmore, four pages of the New York Times. He told him to memorize one word. When the show began, Levitan ripped the pages into four pieces. He had an audience member pick a piece to work with. He continued ripping the pages and having the audience member choose a piece until he was down to an index card size of a page. Then the audience member pointed to a word on the page. Levitan wrote down the word the audience member was pointing to. Then he had Foldes tell the audience what word he memorized. The word was “lurch” and that’s what was written down. Levitan went on to prove the power of love. He asked the audience if they had a photograph of someone important to them with them. An audience member volunteered a photo she had. He then talked about an article he read in Psychology Today where a woman jumped in a river and pulled her baby out of the water. She saved the baby but she didn’t know how to swim. He put the photo in a box. He had only one key to open the box. Then he had a cupful of keys that didn’t open the box. To prove that he had the volunteer take keys out of the cup and try to open the box and it did not open. He told the volunteer to pretend the box is a building with one way in and one way out. Then he had her split up the keys into both hands. He told her to put down the keys she didn’t have a good feeling about. “Now you hear the person screaming,” he told her. Once again she divided the keys into both hands and put down the keys she didn’t have a good feeling about. The tension built. “Now you hear the person pounding on the wall,” he said. She separated the keys again, until she had three keys left. Then he told her to choose a key. That key opened the box. As if this wasn’t enough, the volunteer placed the photo face down into Levitan’s hand. David “knows” the picture is a female with dark hair. “It is your daughter. Her name is Tracy,” he said. He was exactly right. So, if he’s not reading minds how does he do it? Levitan who is also an accomplished magician says he throws a bit of magic in his show to make it fun. Levitan, 52, has been studying magic since he was in elementary school. He has been performing since he was 16 years old. The first show he did was with his younger brother for the next door neighbor’s Girl Scout troop. “The kids had a blast and I was hooked,” he said. He started studying mind reading at an early age as well. 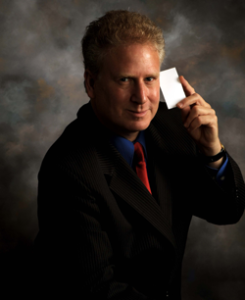 Levitan performs magic and mentalism for corporate clients, at sales meetings, and trade shows where he mixes product information into his act. He also performs at private parties and Bat Mitzvahs. He travels all throughout the US and internationally. For more information go to www.davidlevitan.com.